Amazon on Thursday announced its Mac Software Downloads store, the company’s latest attempt at competing directly with Apple’s various online media outlets. Hawking a modest selection of Mac applications, Amazon’s store can’t compete with the stocked virtual shelves of Apple’s Mac App Store, but Amazon's offerings do include several flagship products the company hopes will give its new service an edge. We took the Mac Software Downloads store for a spin to check out the browsing, purchasing, and installation experiences. We also wanted to see how Amazon’s outlet stacks up against the Mac App Store. On this rather nondescript page, you’ll see the usual Amazon layout: a directory of sub-topics on the left, featured titles (with icons and descriptions) down the right-hand side, and a couple horizontal-scrolling groups of titles in the middle—currently one for “Hot New Releases” and the other for software that costs $50 and less. There’s also a separate Mac Game Downloads page, which you can view by clicking the All Games item on the left, and which currently features “Best of” and “$6.99 and Under” game collections. Recognizing the appeal of computer games, Amazon displays separate links to both Mac Downloads and Mac Game Downloads from many places within the Downloads store. Go to any category page, and you can browse downloadable Mac software by category (Business & Office, Children’s Software, Education & Reference, and so on), average customer review, price, or current discount—the latter few being options I’d like to see Apple offer as options for Mac App Store browsing. However, Amazon’s selection is currently rather limited, as you can choose from among only 217 titles at the time of this writing—and approximately 130 of those appear to be various foreign-language-learning programs. There are also 15 to 20 software-training programs; nine tax-prep apps; nine map sets for various hardware GPS units; a number of versions of Quicken and QuickBooks; and even a few items listed as Windows-only. And the “131” children’s software titles are basically the same 130 foreign-language-learning programs, cross-listed, along with Canvastic. So while Amazon offers more options for browsing than the Mac App Store, at this point in time, you get a fraction of the variety offered by Apple. 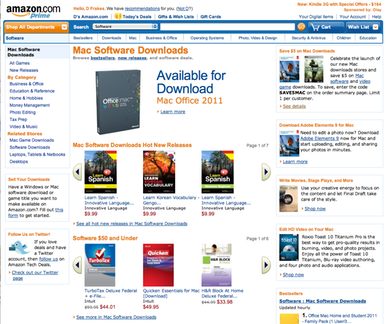 The Mac Software Downloads store looks like most other Amazon pages. To be fair, Amazon’s selection beats the Mac App Store’s when it comes to “bigger” software titles, as Amazon offers—and heavily promotes—multiple versions of Microsoft Office 2011, along with Adobe Photoshop Elements and Premier Elements 9, Roxio Toast, and Final Draft—all at substantial discounts from the manufacturer’s suggested retail price. For example, Office Mac Home and Business 2011 ($280 MSRP) sells for $203, the Home and Student edition ($149 MSRP) sells for $115, and Final Draft 8 ($299 MSRP) sells for $173. On the games front, Amazon’s store currently features only 48 titles, although they include some premium offerings such as Assassin’s Creed Brotherhood, Dragon’s Age II, and Lego Indiana Jones 2, as well as numerous Sims, Civilization, Call of Duty, and Borderlands versions. At the same time, a number of the available games are old titles, such as several years-old Call of Duty installments, and the remainder includes a meager selection of random casual games and a number of games I’d never heard of. It’s also worth noting that this isn't the first time Amazon has sold downloadable Mac software—last November, I purchased the downloadable version of H&R Block’s tax-filing software, and it used a similar download-and-install process. In this respect, the store essentially consolidates all downloadable Mac software in a single “storefront” while adding more titles (granted, some of them being quality software that wasn’t previously available for download at Amazon). Unlike the Mac App Store, which requires you to have Mac OS X 10.6.6 or later for both the store application and any software you purchase using it, Amazon’s downloading software requires just OS X 10.5. However, each software title you purchase may have different system requirements, so you’ll need to check the requirements for each (viewable on its detail page) before purchasing. While it’s nice that some software from Amazon's store will run on pre-Snow Leopard Macs, there’s something to be said for consistent system requirements. Just as the Mac App Store makes it as one-click easy to buy Mac software as iTunes makes it to buy media and iOS apps, the software-buying process on Amazon’s Mac Software Downloads store is similar to the process you go through to buy MP3s from Amazon. On any software page, click the Buy And Download button; enter your Amazon e-mail address and password when prompted; and then, on the Review & Purchase page, click Complete Purchase. Buying Mac software is much like buying anything else on Amazon.com. I purchased Adobe Photoshop Elements 9, which is currently selling for $79.74 (although entering the code SAVE5MAC will take $5 off the price of a single download until June 1). Once the purchase is complete, you get three options for downloading your new software: you can click the large Start Download button on the confirmation page; you can click the Want To Download Later? link to have Amazon send you an e-mail message containing the download link; or you can visit your account’s Software Library page on the Amazon site at any time. This is where the process gets quite a bit less convenient than buying through the Mac App Store. The first thing you actually download is a small disk image (2.1MB in size, in my case) containing an application-specific [Software Name] Downloader program. Open this disk image, if your browser doesn’t mount the image automatically, and double-click the Amazon Software Downloader.app inside. After a few seconds, the Downloader program begins downloading the purchased software—not to your Downloads folder, or even to your Applications folder, but to a new folder on your Desktop. 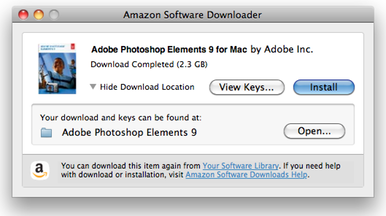 Amazon’s purchase-confirmation page listed Photoshop Elements 9 as a 2GB download that would take one to three hours over a broadband connection. The actual Downloader program was a bit more optimistic, noting the size of the download as 2.3GB but estimating it would take just under an hour to finish. On my Comcast cable-modem connection, the actual download time ended up being around 45 minutes, which isn’t too shabby. Once your software has been downloaded, it's time to install it. Unfortunately, at least for my trial run with Photoshop Elements, clicking Install here didn’t actually install the purchased software. Instead, it simply mounted the aforementioned PhotoshopElements9.dmg disk image. It was up to me to figure out where to go from there. (Although there were copies of Adobe Photoshop Elements 9 Read Me.html in four languages, none of them explained how to actually install the software.) I double-clicked the Adobe Photoshop Elements 9 item, expecting it to launch an installer, but it turns out that was just a folder with a custom icon. Inside that was Install.app (along with several folders named deploy, packages, and payloads). Double-clicking Install.app launched the Photoshop Elements installer, which prompted me to enter my 24-character license key, to sign up for an Adobe ID, and to choose which components of Photoshop Elements I wanted to install. After providing an admin-level username and password, and quitting applications that were currently using Flash (for reasons that only Adobe knows), the installation proceeded. Granted, part of the hassle here was due to the fact that I opted to purchase Adobe software, and Adobe has one of the worst records around when it comes to making software installation easy and simple. But even with an easier-to-install package—for example, the currently free game Airport Mania: First Flight—the process isn’t nearly as simple as if I’d purchased something off the Mac App Store. Clicking Install in the downloader app simply mounted the AirPort Mania disk image; I had to manually drag the AirPortMania.app program to my Applications folder. And when I was done, I had to manually quit the downloader program. In other words, whereas the Mac App Store handles the entire process of obtaining and installing software, Amazon’s offering essentially replaces only the parts of the traditional software-buying process up until you've inserted the software CD or DVD in your optical drive. Past that point, not much has changed—you still need to perform the installation manually, whatever that process may be for a particular piece of software. There are also a number of after-sale differences between the Mac App Store and Amazon’s Mac-software store, and these details illustrate the different approaches taken by Apple and Amazon. Each software manufacturer has a different policy on how many installations are allowed. The user licensing agreement that comes with the software you purchased tells you how many installations and users you are allowed with your purchase. Which means that you, as the user, are responsible for figuring out what you can and can’t do with each bit of software you purchase from Amazon’s software store. Of course, and related to these license issues, installing a Mac App Store-purchased program on a second computer is as easy as signing in to the Mac App Store on the second computer and clicking the Install button next to the desired program. With Amazon software purchases, you either need to access your online Software Library from the second computer and then go through the download and installation processes explained above, or you need to copy the installation disk image—assuming you still have it—from the original computer to the second computer, and then install the software, manually entering your license key, if applicable. Some games and software will automatically look for patches and updates for you. For other products which do not automatically update, you may need to find updates and patches directly on the product manufacturer’s website.